The PINK ELEPHANT is nonplussed by this turn of events. He regains his COMPOSURE and proffers you another CUP of TEA. WILL THIS TORMENT NEVER CEASE??? DISTRACT the ELEPHANT by pointing BEHIND HIM and SHOUTING, "Look! A spare pair of green shorts!". RUN back to OFFICE while he's looking. Punch the PINK ELEPHANT with your TEH THUNDERBUSS. Drink TEA, gain (temporary) ability to see through SPACE-TIME. 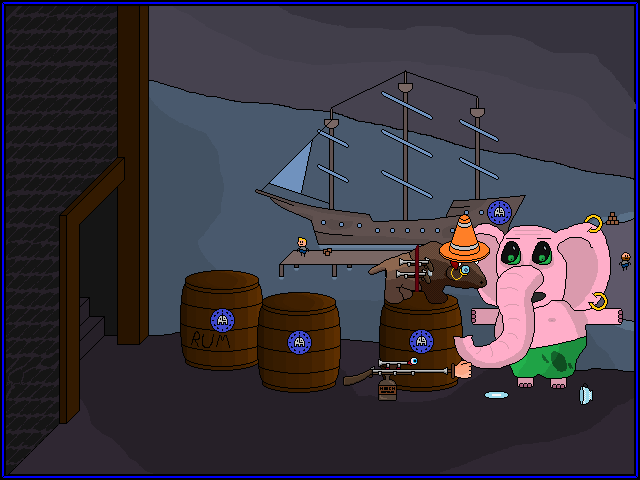 The Elephant needs an awesome Hat to complete that outfit! Give him the Cone to wear. Gulp down tea. If it burns, it's real.